Drivers choosing convenience over pedestrian and transit users’ safety will be the focus of the #YourStreetsYourSafety Summer Traffic Safety Campaign this week in the downtown core from September 10 to 16. Traffic Services is supporting local officers in week-long initiatives, throughout the Summer and early Fall, to focus on four key areas of road safety: distracted driving, impaired driving, aggressive driving and speeding. Traffic Services Constable Clint Stibbe said the danger to pedestrians downtown is often at intersections. He said drivers have a choice to keep people safe. 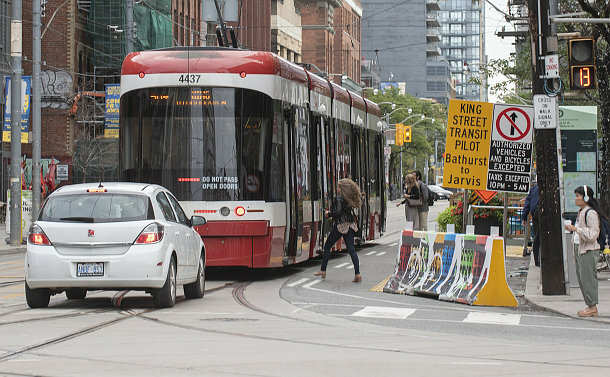 Stibbe said officers will be focusing their attention on King St. where a pilot project does not allow cars to proceed through intersections between Bathurst and Jarvis Sts. in order to help move streetcars faster across the city. Disobeying a sign or proceeding contrary to sign at an intersection carries a $110 fine and two demerit points. The Summer Traffic Safety Campaign will see additional enforcement of intersections, school zones and impaired driving, rotating through all areas of the city as part of efforts to support the Vision Zero action plan to reduce traffic-related fatalities and serious injuries on Toronto’s streets. Traffic Services Superintendent Scott Baptist said the police role in Vision Zero is to raise awareness of how to stay safe on the streets as well as enforce the laws designed to create a safe environment on the roads. “We believe strategic enforcement throughout the city shows these types of behaviours will not be tolerated,” Baptist said.